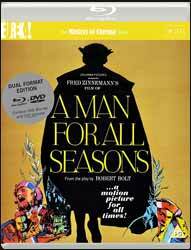 A Man for All Seasons (1966. 2 hr, 25 sec) is a historical dramatic film, directed by Fred Zinnemann from a screenplay by Robert Bolt and based on Bolt's original play. The film won six Oscars, nominated for a further two, five British Academy Awards and four Golden Globes. More was an interesting man, and a notable presence in the history of science fiction. While descriptions of idealised societies had, a long history dating back to Plato’s Republic (380 BC) it was More who created the term ‘Utopia’ for his 1516 novel of the same name, opening up a new genre for utopian and dystopian stories. The film depicts More as a thoughtful and devout Catholic. Played by Paul Scofield (1922 – 2008), he imbues the character with both the necessary gravitas, but also can show More’s wit, humour and gentleness when dealing with his family. Henry VIII is ably played by Robert Shaw (1927 – 1978) as a wildly unpredictable character, at times full of good humour, but able to fly off into rages at the slightest idea of disagreement. I thought that this was an unfortunate caricature, Henry was obviously capable of deliberate acts of violence, just ask the many wives he killed on spurious grounds, but the need for Henry to have an heir was a serious political problem. The War of the Roses (1455 – 1487) was still in living memory, a civil war which did great damage to the country and was only really ended with the ascension to the throne of Henry VIII’s father, Henry VII, although plots to unseat the Tudors continued. The viper in More’s bosom and the man who would guarantee his conviction was Richard Rich, played by the incomparable John Hurt (1940 – 2017), as a scheming weasel of a man, who falls under the influence of Thomas Cromwell, played with great relish by Leo McKern, (1920 – 2002). The film also has an impressive supporting cast, including Orson Wells as Cardinal Wolsey, Wendy Hiller as Alice More, Susannah York as Margaret More, Nigel Davenport as the Duke of Norfolk and Vanessa Redgrave as Anne Boleyn. There is little that can be faulted with the film, with the costumes and sets displaying the resplendent excess of the Tudor court. As an exercise in integrity and humility in the face of a tyrannical sovereign, the film succeeds on almost every level. The DVD comes with several extras. The Life of Saint Thomas More (18 min, 16 sec) put the film in its historical context and discusses why he is now lauded by both the Catholic and Protestant church. Neil Sinyard (31 min, 24 min) discusses the play and subsequent film. You get the Original Theatrical Trailer (3 min, 19 sec), which unlike the film has not been restored. The film also contains an illuminating commentary by historians, Nick Redman, Julie Kirgo and Lem Dobbs.